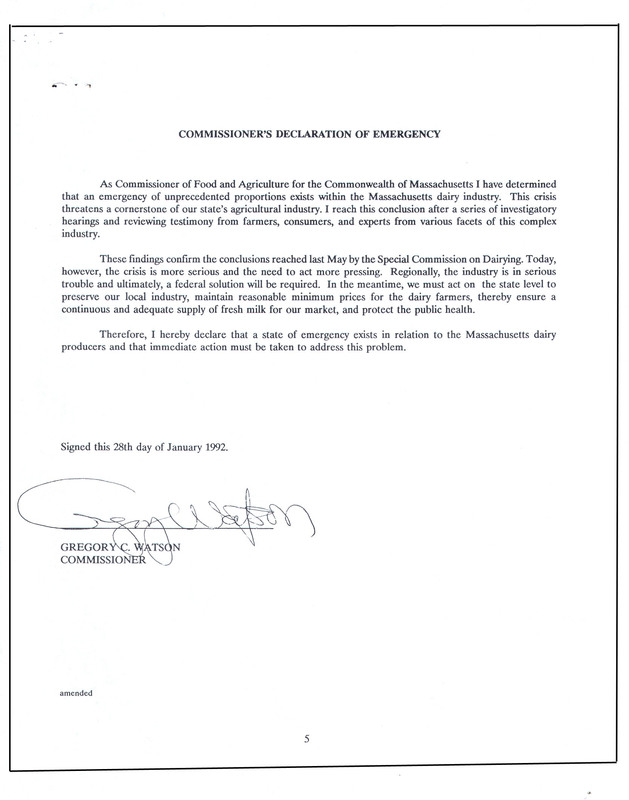 I was sworn in as Massachusetts Commissioner of Food and Agriculture in September 1990 by Governor Michael Dukakis. 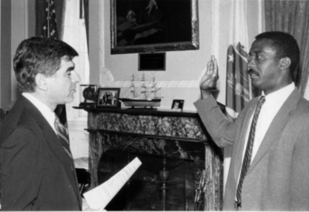 The Governor had been the Democratic candidate for President of the United States in 1988, losing to George H.W. Bush. He decided not to seek a fourth term as Massachusetts Governor. 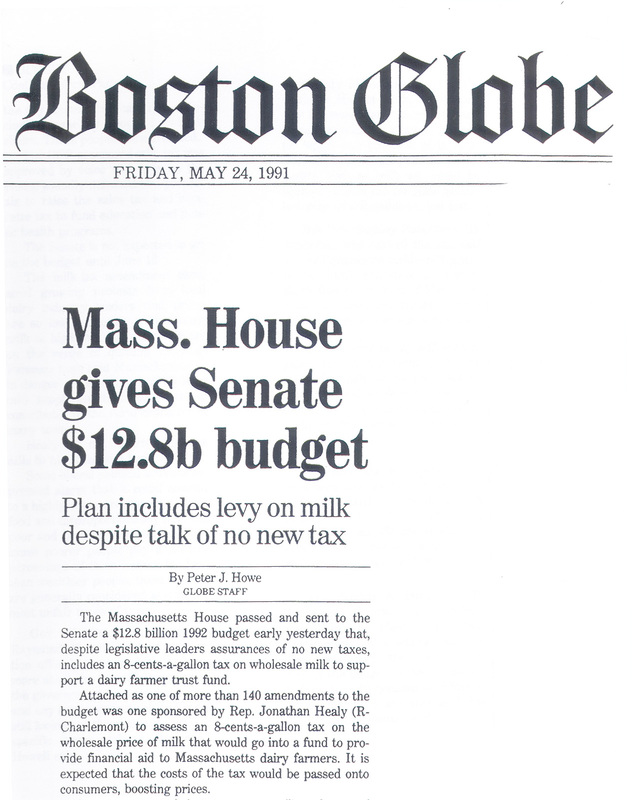 He was succeeded by Republican William Weld who took office in 1991. 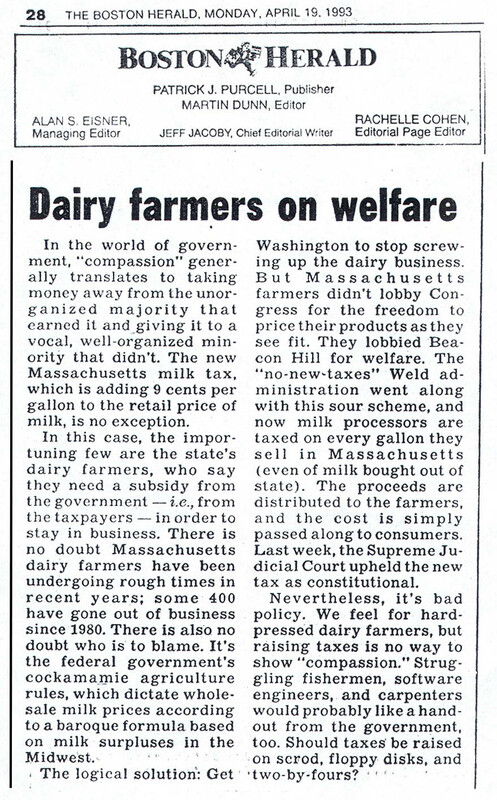 Opponents to the vendors fee included the conservative press (Boston Herald) and the dairy processors who were ordered to provide the payments to make payments to the state dairy stabilization fund. 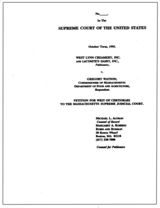 ...But they were successful in getting the U.S. Supreme Court to hear the case. 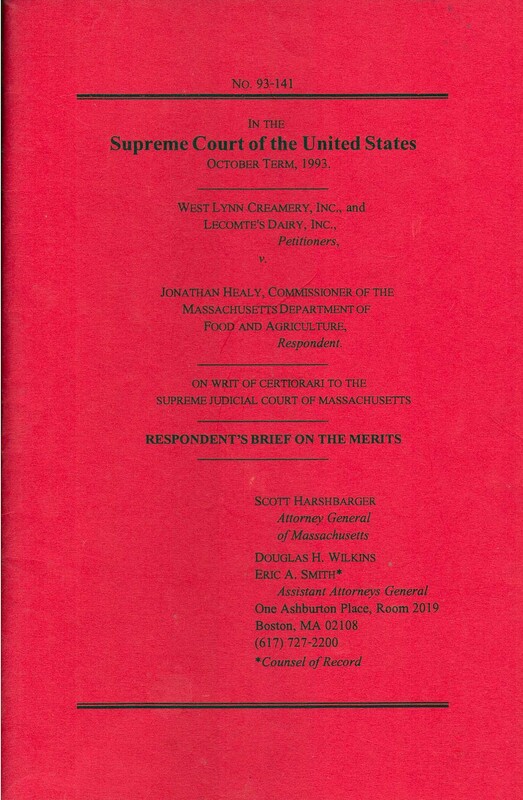 Click Here to read an account of the U.S. Supreme Court hearing (Now West Lynn Creamery, Inc. vs. Healy). 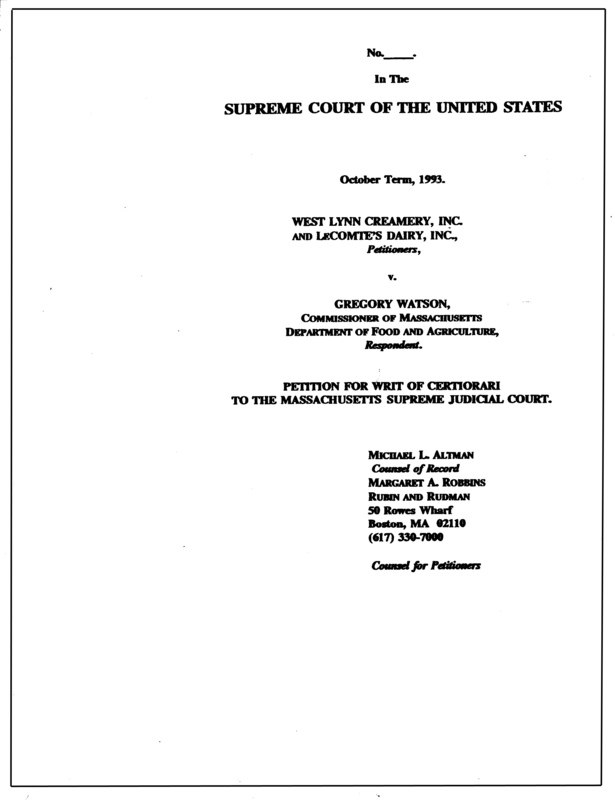 Even with the progressive policies initiated by Massachusetts Commissioner of Food and Agriculture Frederic Winthrop back in the 1970s, many farmers in the Commonwealth continued to find it difficult to compete against large corporate farms in other parts the country. 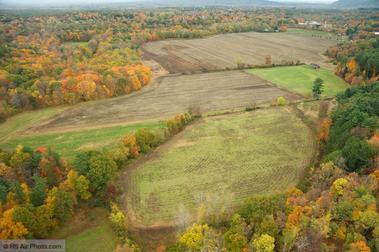 Federal farm policies, in fact, were not designed with New England farmers in mind. 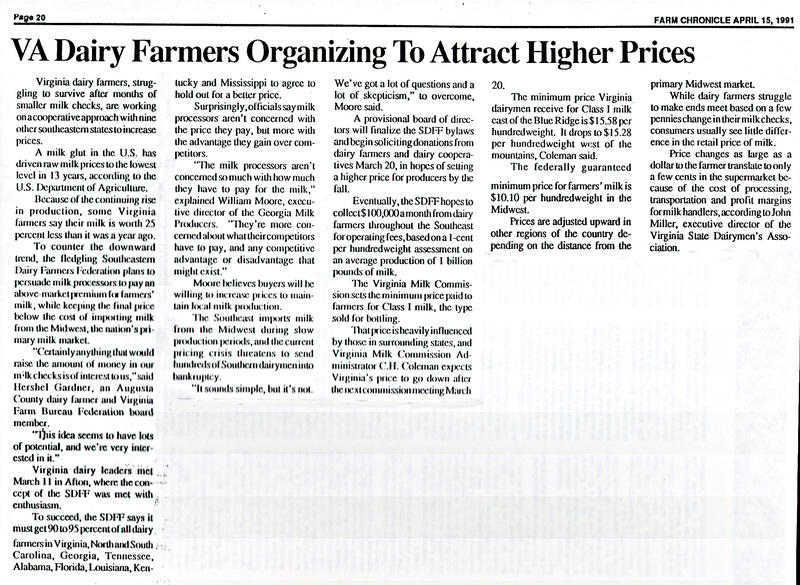 "Last year (1991), dairy farmers lobbied for an eight cents per gallon "vendor's fee" to be paid by the wholesalers on all make sold in the state regardless of its origin. 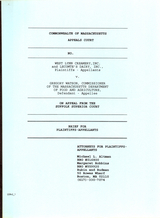 Though there was broad support for the measure among consumers, environmentalists, hunting organizations, and even some Boston talk-show hosts, the measure was viewed by the Weld administration as a tax. It lost by one vote in the Senate. 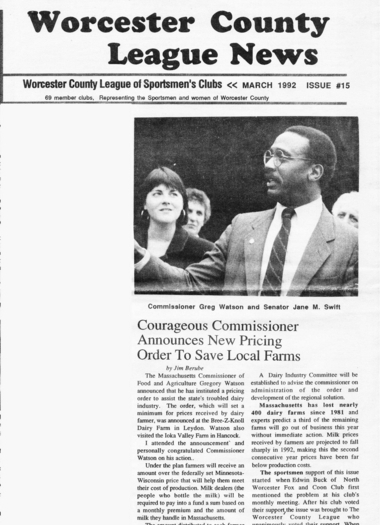 The Worcester County League News headline is really embarrassing and unintentionally misleading. I had a strong and committed team at the Department of Food and Agriculture who made this happen. Most notably were General Counsel Tara Zadeh, Assistant Commissioner Charlie Costa, and Director of Markets, Jim Hines. 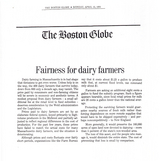 Other key players included the Massachusetts Farm Bureau (Jay Slattery, John Bragg, Pam Comstock), The Massachusetts Association of Dairy Farmers, The Berkshires Natural Resources Council and the Massachusetts Attorney General's Office (Eric Smith). 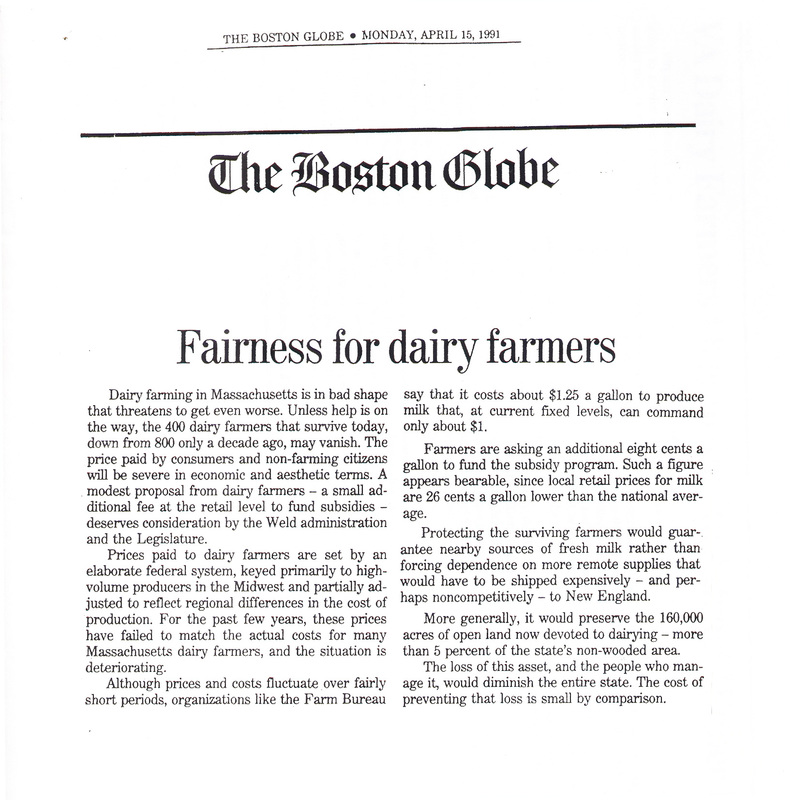 In 1990 Massachusetts dairy farmers were stewards of over 300,000 acres of open space across the Commonwealth. A significant portion of those acres were integral to the state's efforts to create a series of green corridors. 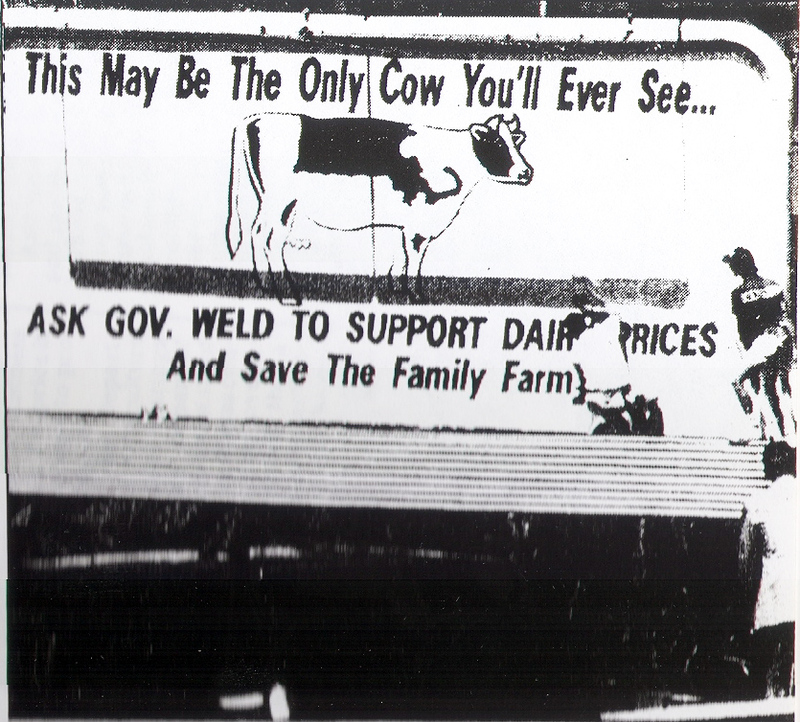 While Governor Weld was primarily concerned that the dairy vendor's fee would be perceived as breaking his no new taxes pledge, the dairy processors feared that the issue was serving as a vehicle for uniting and organizing dairy farmers. The nature/culture of dairy farming combined with the incredible workload made organizing extremely difficult. However, the processors realized that if they spoke with one voice, they could develop leverage against them and their profits. 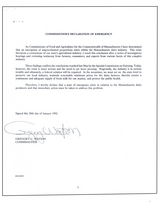 Massachusetts farmers lobbied hard in my support during the gubernatorial transition. Governor William Weld asked if I wanted to continue serving as Ag commissioner. I told him that I did. Bill Weld had campaigned on a "no new taxes" platform.He made it clear that he did not support the vendors fee, but he would not prevent me from fighting for it as long as I keep it from being portrayed as a tax. 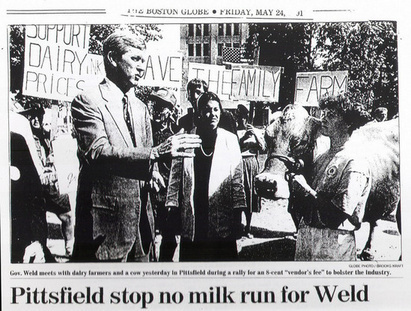 We found ourselves constantly walking a delicate tightrope between Governor Weld and his staff and what we thought was in the best interest of Massachusetts farmers and open space advocates. 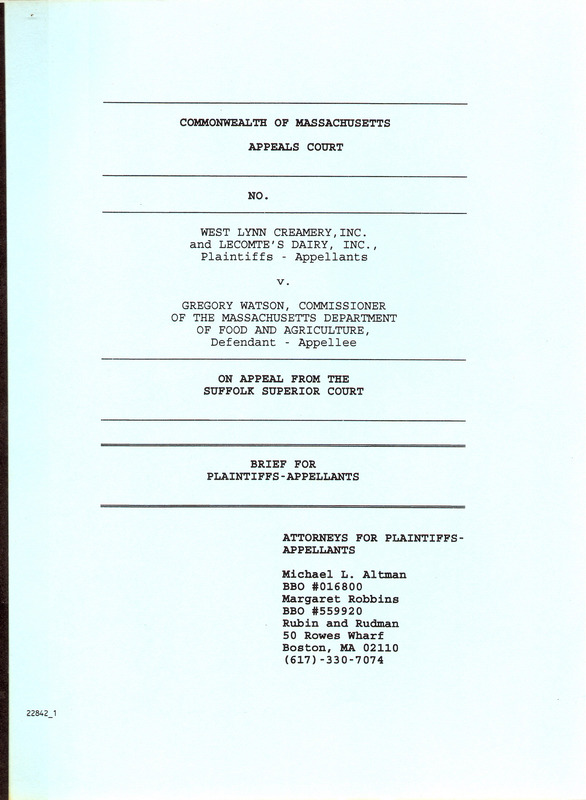 By the time the case was heard before the U.S. Supreme Court, I had moved on to The Nature Conservancy. 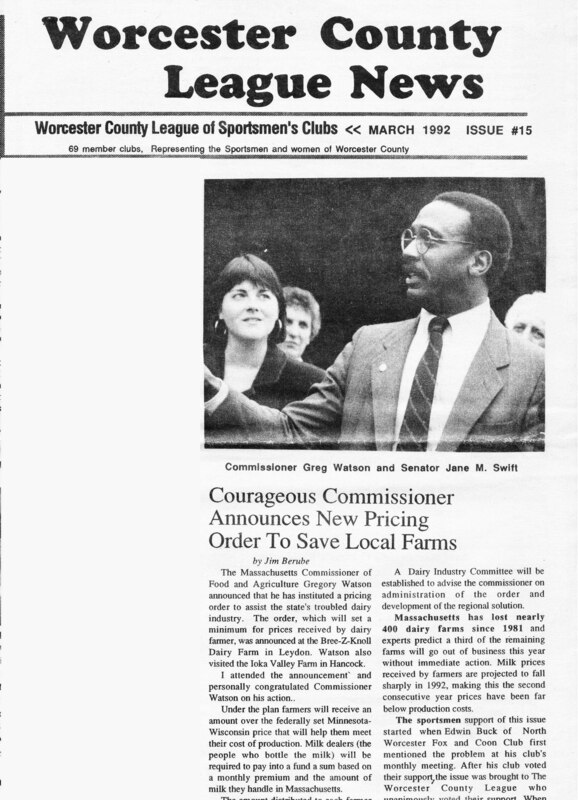 Jay Healy was serving as Commissioner at the time. although I did travel to DC for the hearing. 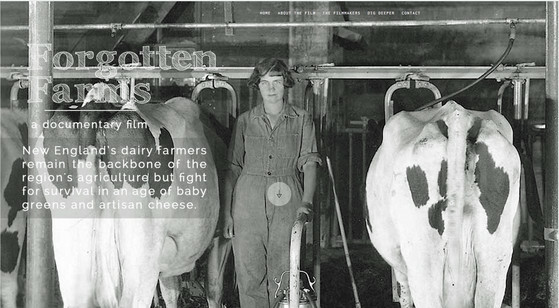 Forgotten Farms examines class divisions and cultural divides in New England's farm and food communities. 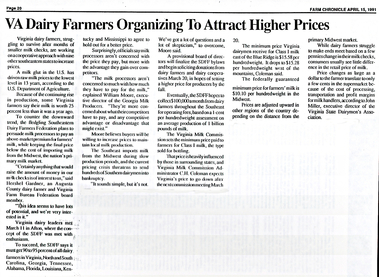 In some circles, farm-to-table restaurants, farmer's markets and CSAs are booming and the new farmers are celebrated. But there is another farmer who is left out of the local food celebration. 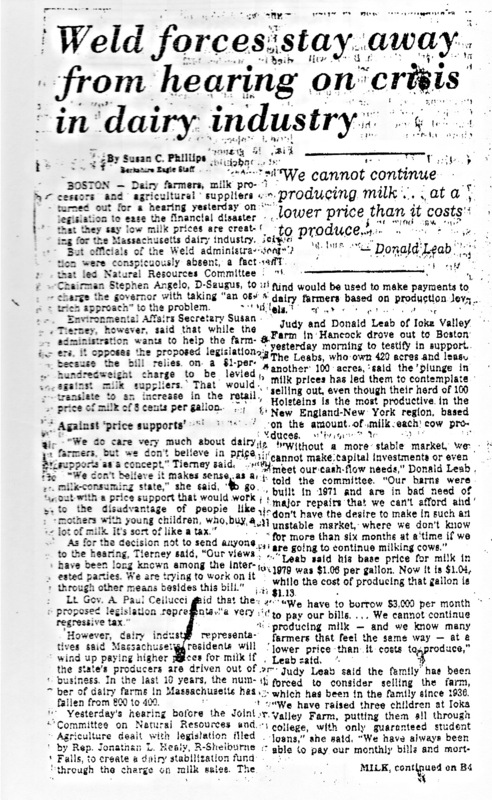 New England has lost over 10,000 conventional dairy farms in the past 50 years; 2000 farms remain. 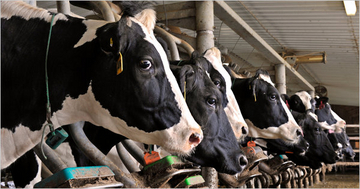 Collectively, they tend 1.2 million acres of farmland and produce almost all of the milk consumed in New England. 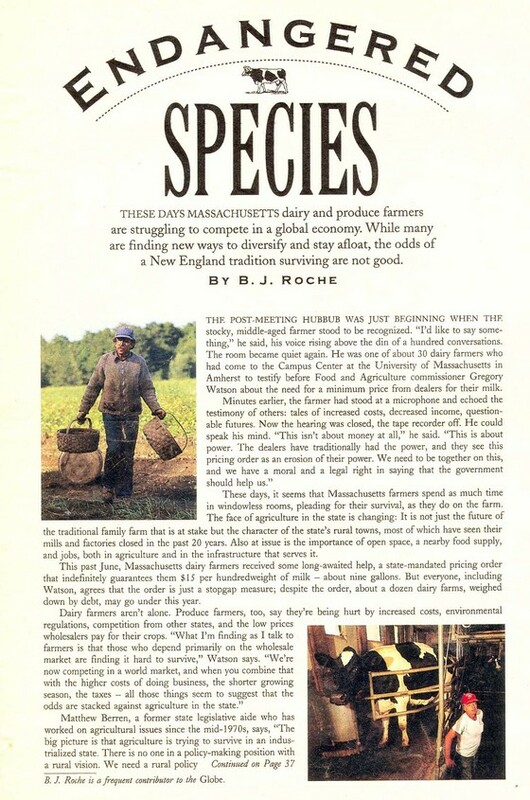 In our enthusiasm for the new food movement, many of us have forgotten that 75 years ago these farmers were at the center of a thriving local food economy. 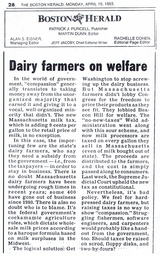 Through conversations with dairy farmers and policy experts, we reconsider the role of these fascinating but forgotten farmers.